A professional videographer who enjoys helping amateurs master the basics of desktop video. S-video (short for Super-video) is an older type of video signal that's transmitted in varying electrical signals over wires to represent the original video. Newer video cables like HDMI transmit digital video signals in the form of numbers representing the original video signal. The benefit of digital video is that the signal doesn't degrade from source to destination. It's also capable of transmitting much higher resolution video. However, there are still electronics today that have S-video ports, so understanding the technology and how to use it is useful for troubleshooting problems you may have. For example, if your TV's S-video input has trouble finding a signal. Instead of using older S-video cables, upgrade your electronics to models that can send and receive digital video. You'll enhance your video and take full advantage of high definition technology built into televisions and computer monitors. S-video technology, where the analog video signal in its original form is carried over wires, only transmits standard definition video, which has a resolution of 480i or 576i. S-video is an improvement over composite video, which carries all the video data (including both brightness and color information) in one signal over one wire. S-video carries brightness and color information as two separate signals, over two wires. Because of this separation, video transferred by S-video is higher quality than that of composite video. S-video has a variety of uses, including connecting computers, DVD players, video consoles, video cameras, and VCRs to TVs. S-video ports can be either 4, 7, or 9 pins. You'll recognize them on your computer or TV because they're a round port with multiple holes and a slightly flat bottom. Like composite video, which is typically the yellow cable in a three-plug wire setup, the S-video cable only carries the video signal. So, composite audio cables are still required (the red and white composite wires). Using the S-video instead of the composite wire provides much better color resolution. Composite (yellow wire) video technology is based on original television technology, where color was made possible by transmitting color information over a single wire. S-video improves color in the signal by transmitting color information over a separate wire. The S-video cable transmits video through two synchronized signal and ground pairs, named Y and C.
Y is the luma signal, which carries the luminance. This is the brightness or black-and-white elements of the video. It also includes horizontal and vertical synchronization pulses. C is the chroma signal, which carries the chrominance. This is the color portion of the picture. This signal includes both the saturation and hue elements of the video. S-video is also known as component video and Y/C video. 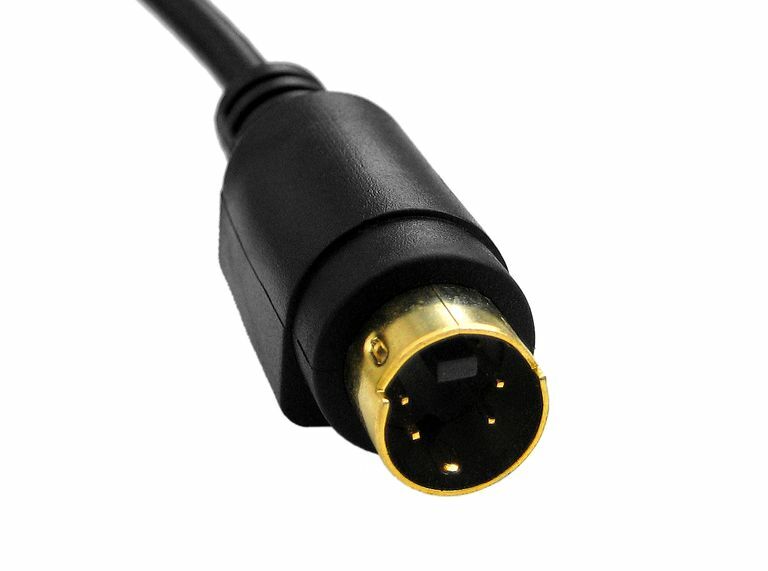 If both your output device (computer, DVD player, or game console) and your input device (television) have an S-video port, all you need is an S-video cable with the correct number of holes at each end, and you can enjoy a higher-quality video. To use S-video to connect audiovisual equipment, both devices must support S-video and have S-video ports or jacks. An S-video cable connects the two devices. Press Source or Input on your TV remote and make sure to select either composite or component input. Double-check the cable end and the port you've plugged it into. Are the number of holes the same? If not, purchase an adapter for that end. Make sure your source device (computer or game console) is sending its video out through the S-video output port, and check the video settings. If the device you're trying to connect doesn't have an S-video port, find an adapter that will convert composite video, digital ports, DisplayPort, or HDMI into an S-video cable that plugs into your TV. Or, find an adapter that converts from an S-video cable to HDMI or RGB input that plugs into your TV or computer monitor. With the advent of HDMI and other digital video solutions, fewer electronics manufacturers are shipping devices with S-video ports. But until they're all gone, there are plenty of adapter and cable solutions to help you hook up older devices to new ones. Do Video Signals Need to Be Routed Through a Home Theater Receiver? You've Seen Them, But Do You Know What an RCA Cable Is? Can DVD recorders connect to an Antenna, Cable, or Satellite Box? So, You Want to Record TV on Your Computer? That's Easy!